When I looked at microphones for speech recognition a few years ago, Bluetooth microphones didn't offer good enough voice quality for use with Dragon Dictate, the Mac benchmark for dictation software. Since then, advances have been made in Bluetooth technology, so it’s a good time to look specifically at wireless microphones that offer good enough sound and noise cancellation to use with Dragon Dictate. I tried two Bluetooth microphones and one DECT model. Note that I only discuss these mics for use with speech recognition, not other features such as using them with an iPhone, landline or Skype. The Bluetooth microphones I discuss in this article use USB dongles. You might think it would be easier to connect to your Mac’s onboard Bluetooth, but that’s not the case; the advantage of using a dongle is that it provides wideband audio, which ensures better speech recognition. Dragon Dictate detects when a microphone offers wideband audio, and uses its enhanced Bluetooth mode. When I tried these microphones connected to my Mac’s onboard Bluetooth, Dragon Dictate typed much more slowly, was less accurate, and I found that typing with my Bluetooth keyboard lagged a bit as well, as if there wasn’t enough bandwidth for voice and for my keyboard and trackpad. When testing these microphones, I created new Dragon Dictate profiles for each one, and only did the minimal voice training, which is about five minutes. So the accuracy that I saw with each of these mikes doesn’t reflect a more established profile that has learned from my corrections and vocabulary. 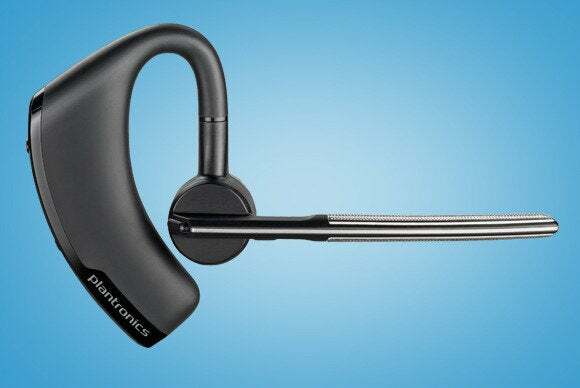 The $200 Plantronics Voyager Legend UC Bluetooth headset ( ) is a compact Bluetooth headset, designed like the headsets you often see people using with cell phones. In some ways it’s like an old-fashioned hearing aid; it has a large battery that goes behind your ear, and you can only wear it in that way: there’s no headband or neckband. Some people may find it uncomfortable, but the ear hook is soft rubber, and it didn’t bother me, even though I wear glasses. The Voyager Legend UC has a shorter boom than the other two microphones I tested and offers about seven hours of talk time. It uses Bluetooth HFP 1.6 wideband audio and has efficient noise canceling. It also comes with a charging case, which is a nifty plastic box that not only stores the microphone safely, but also contains a battery. To charge the microphone, you place it in the box, then plug a micro USB cable into the end of the box. This charges the battery in the box and battery in the microphone. If you need more power during the day, just put the microphone back in the box and it will charge from the box’s battery. The Voyager Legend UC Bluetooth headset is a bit less accurate than I would like; most likely, this is due to the short boom. Since it's further from the mouth than the other two mics I tested, it doesn’t pick up your voice as well. It’s certainly usable, but I had to make more corrections and I had to pay more attention to the way I speak than with the other mics. I also had some problems getting the Voyager Legend UC to pair with its Bluetooth dongle. When connected to a USB hub, pairing was unreliable; I had to connect the dongle directly to my Mac. This headset would best suit people who want to use it on the go, especially combined with its charging case. It’s the easiest to store, and the easiest to charge. However, if you want the best accuracy, this is my third choice. The $170 VXi VoxStar UC ( ) uses Bluetooth HFP 1.6 wideband audio, and offers excellent noise cancellation. Wearable in three modes—with a headband, neckband or ear hook—this microphone is light and comfortable, and claims to offer more than seven hours of talk time. It charges with a standard micro USB cable, which you probably already have for other devices. The boom of this microphone is longer than standard Bluetooth mics, such as the Voyager Legend. For me, it reaches near the corner of my mouth, ensuring better sound pickup. It is light and comfortable, and you can wear it in many ways, to get the best fit for your usage. The VoxStar UC is accurate enough to replace just about any wired microphone. Of course, there is a trade-off between the freedom of wireless and the fairly high cost of this microphone compared to the cost of wired microphones, but if you do want a wireless microphone with excellent quality you can’t go wrong with the VXI VoxStar UC. In many ways, the $450 Plantronics Savi W745 ( ) may be more than what you need, but it may also be the microphone you really want. This microphone uses DECT technology rather than Bluetooth, and comes with its own charging base station. You connect the base station to your computer via a USB cable, and, as with the other microphones, you can use it with telephones, either a DECT wireless telephone, or a Bluetooth phone. Three buttons on the base station let you choose which device to connect to. You can wear this headphone in three ways: with a headband, neckband or ear hook. it also comes with several different sized ear tips, so you can find the most comfortable fit. There are different models in this product line, but the high-end 745 comes with an additional battery that you can slip into the base station to charge. You can change swap batteries on the headset in seconds, giving you potentially unlimited talk time. The Plantronics Savi W745 shines in its accuracy. DECT technology provides better sound than Bluetooth, and this microphone is the most accurate of the three I tested. This is not to denigrate the VXI VoxStar UC, which comes very close. DECT technology offers much longer range than Bluetooth, up to about 350 feet. You’re unlikely to want to dictate that far from your computer, but if you do want a multi-function headset—to use for dictation and telephone calls—this one is much more flexible. Wireless headsets have to come a long way in recent years, with the adoption of improved Bluetooth technology. Since the two Bluetooth models I’ve looked at use their own dongles to provide wideband audio, they’re good enough to use with speech recognition software such as Dragon Dictate. All three of these headsets are excellent choices, but each one meets different needs. The Plantronics Voyager Legend US Bluetooth is the most portable of the three, especially thanks to its innovative charging case. If you’re an occasional dictator, but want to use it with a phone on the go, you might find this to be your best choice, because of its compact size, and charging case. The VXI VoxStar UC has excellent accuracy with Dragon Dictate, but is slightly less portable; if you’re planning to just use the headset to dictate in your office, it’s the better choice of the two Bluetooth models I tested. If the only place you want to use a wireless headset for dictation is in your office, then I recommend the Plantronics Savi W745. It has the best accuracy, its hot-swappable battery gives you unlimited battery time, and it’s the most versatile of the three headsets. Obviously, this comes with a higher cost, but if you’re serious about dictation, you probably already know the value of a good headset.